I’ll be the first to admit it; I wasn’t always such a wonderful cat mom in my early years as a cat mom. I got Duncan when I was 20 in college. He’s lived quite the adventurous life involving something like 8 apartments with multiple cats and a crazy little dog who tried to eat him. He also has had lots of friends of the human variety to live with. One of those friends is also my friend. Her name is Jessi. Jessi is also on my informal typo crew/is my informal typo crew; she sends me emails of mistakes I’ve made, haha. I didn’t think I needed one, but Jessi showed me otherwise. Here is her email from my April Fools prank. I laugh whenever she writes to me. She should start a blog, or at least I’ll have her as a guest. Her email was titled: I hate you. Ouch (but then I found out that was like an April Fools joke). You’re a jerk. I was totally revolted and surprised and perplexed and…and…yuck. I’m glad that the grammatical nonsense was a prank. I thought you were getting sick. You know that’s the only April fools joke anyone played on me and it’s April 2 when I’m reading your blog. Lame. P.S. I don’t really hate you, but I can’t say that I wasn’t mildly annoyed at your crazy behavior at first. Then I was relieved that you didn’t make all of those mistakes…mistakenly. Then I thought it was kind of clever and cute. Now I’m just sad because I think the humor will be lost on most. Oh well, happy April! You’re forgiven. It’s cool though. I appreciate her help since I generally just type all stream-of-consciousness (if you haven’t figured that out already) and generally can’t be bothered to go check it over when I publish it to the world. Eh. Lazy? Perhaps. Disinterested with details? Yes. So anyway, Duncan and I were more like roommates than a cat mom and her cat son. Jessi kind of stepped into that cat mom role and Duncan ate it up. Now I’m not jealous or anything now….but I would be lying if I said I wasn’t jealous back in college. 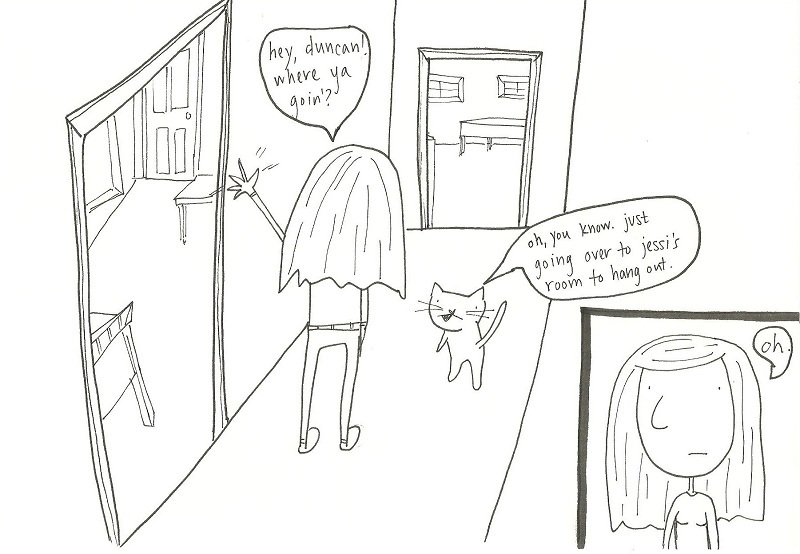 Duncan would saunter in and out of her bedroom all the time without so much as a tail whap in my direction. I don’t think she was trying to steal him from me or trying to one-up me in cat whispering or anything; I just wasn’t an attentive cat mom and Jessi had the right stuff that Duncan was looking for emotionally. She was also good at petting him and he liked it. So anyway, thanks Jessi for teaching me what a good cat mom looks like and I attribute Duncan’s and my fabulous relationship to the skills you taught me when I was sitting alone in my room while you were playing with Duncan. Oh, tartar sauce. In honor of Jessi, I also have elicited the use of sarcasm in this post. She’s really good at that, too. For hilarity and inappropriateness I was hoping for a mistake to have been made.